As a die hard fan, I though Yes' performance was fantastic. However, this particular festival was not the best place for a Yes show. 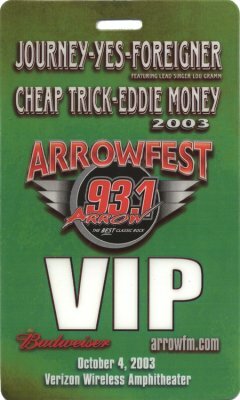 For 90% of the Audience, their entire exposure to Yes consisted of what they've heard on the local classic rock station, Arrow 93.1 (The Arrow in Arrowfest). Thus, they've only ever heard Roundabout, I've Seen All Good People, and less often, Owner of a Lonely Heart or Starship Trooper. The drunk and unruly crowd came to hear hits from each of the 5 bands. It was annoying enough to hear the woman behind me shout, "Play Roundabout," at the start of every song that wasn't Roundabout. It was more irritating to hear complaints at the end of Yes' set from people who didn't enjoy the performance at all. I've seen Yes many times and I'm impressed and pleasantly surprised every time. Their performance of And You And I was great, I also enjoyed We Have Heaven and South Side Of The Sky, which they've brought out of the Yes archives for last couple of tours. There were sound problems all day for all of the bands. Probably due to the quick setup between each set. Kudos to the crews for keeping the break between each band to a half hour or less. 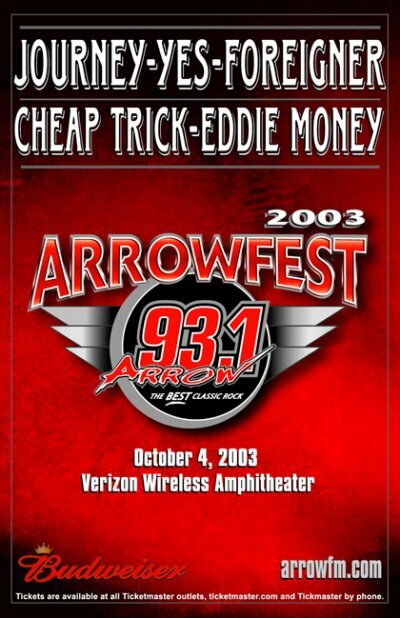 In spite of the crowd and after sitting through 3 hours of Eddie Money, Cheap Trick and Foreigner, I really enjoyed the show. I will always enjoy Yes' live performances more than their studio recorded albums. I pray for their health, as they are all aging, so that I can enjoy Yes shows until I'm old and gray. Even then I'll have someone push me in my wheelchair to the show.